Some of the cast of the original Star Trek. 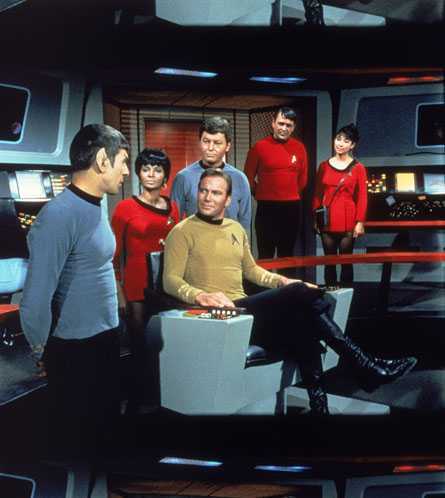 As far as I’m concerned, no science fiction series set in space holds a candle to the original Star Trek series; it’s fun and campy without being distractingly so, the plots and acting hold up well over time, and it is chock-full of lessons that encourage personal growth. Over the years I’ve grown and learned a lot while watching the show. The growth is probably due to my love of potato chips but the learning is all thanks to Star Trek. You see, this seemingly simple science fiction show actually can teach you a lot about life. Here is a small sampling of some of the life lessons Star Trek bestows on its viewers. The buyer should always beware: In the season 2 episode, The Trouble with Tribbles, lieutenant Uhura buys a mysterious little pet while on shore leave. The animal is called a tribble and she has never heard of them before. She doesn’t ask any questions about its care and doesn’t seem curious about any problems or pitfalls of the species. She just falls in love with the cuddly, trilling thing and buys it. The next day, Uhura’s tribble has babies, which she gladly gives away to other crew members. Before you know it, the USS Enterprise is overrun with tribbles. They crowd the bridge, have gotten into the ship’s mechanical system (much to Scotty’s chagrin) and they are eating all of the food. It turns out that 50% of each tribble’s system is devoted to reproduction and they have babies about every 12 hours. Like any infestation they must be collected and removed from the ship immediately, which means many lost man hours. All of this could have been avoided if Uhura had asked some questions of the breeder. Once she found out how quickly tribbles reproduced, she would not have purchased one. While you and I probably won’t make any purchases that procreate that quickly and easily, we should always be wary of deals that seem too good to be true and we should find out all the upsides and downsides of our potential purchases before we buy. Look, they need each other. (except during mating season) and Kirk is very emotionally empathetic. 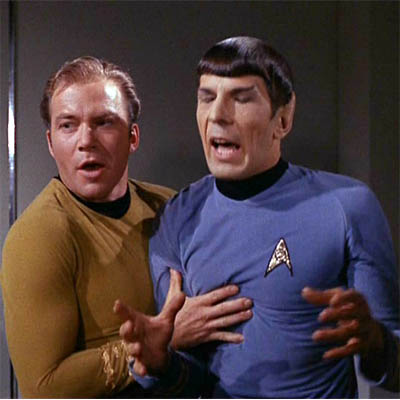 Spock has no pride or hubris while Kirk has a little too much. Together they work as a team to soften each other’s attributes and create decisions that are founded on both logic and emotional responses to situations. We regular folk could benefit from learning how to mix objective logic and reason with our emotional side to make decisions that aren’t lacking in either brains or heart. a) Understand what you know and admit what you don’t. How much trouble could they have gotten in if Bones had gone outside his specialty? b) Find the right person for every job. Don’t ask your dog walker to opine on an injury your dog has—go to the vet. When laziness and accessibility come together you end up with the wrong person for the job. 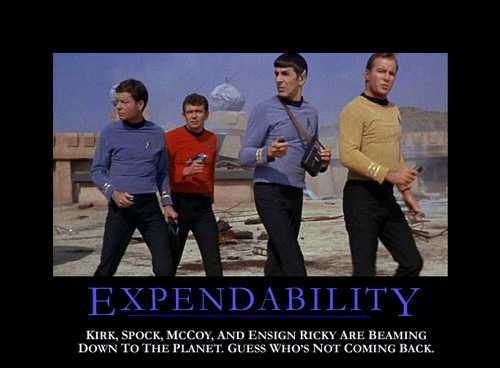 You are expendable… unless you are a main character: When an episode of Star Trek shows an unknown character beaming down to a planet, you can rest assured that there will be a death sometime during the episode. You know who will die? That one dude who beamed down that you, the viewer, had never seen before; the extra. And when the survivors get back to the ship no one else seems to care that this one dude died. If you aren’t an important, outgoing individual at your workplace then no one is going to miss you if you get laid off or fired–which makes you the first choice to beam down to planet jobless. Avoid this by staying involved in committees and projects at work, producing ideas and efficiency measures, and being noticeably good at what you do. Thanks so much for putting the series in proper perspective. I grew as a person watching this series. Since the sixties to the present I haven’t seen anything that has affected my life as much. Although fiction, The values and lessons are now, and will always be, timeless. Thank you Gene and RIP.